One of my favorite author/book series is Joanna Fluke’s Hannah Swenson series. Not only does Hannah bake cookies for a living, she also solves mysteries. Joanne Fluke also provides recipes for the readers. I have found several of my favorite recipes from her books. This is one of those recipes. I don’t remember which book it is from. If you like tart lemon bars, you will like these. They are the lemon bars in a cookie bar form. Yummy! Enjoy! These are wonderfully lemony and quite tart. You may wish to sprinkle them with powdered sugar before you serve them to those who like them sweeter. Beat the butter and the sugar together until they’re light and fluffy. Add the beaten egg, lemon zest, and lemon juice. Mix it all up. Mix in half of the flour and half of the milk. Stir everything all up and then add the remaining flour and the remaining milk. Mix well. Drop by teaspoons onto an ungreased cookie sheet. Make these cookies small, about the size of a cherry. If you make them too large, they’ll spread out on the cookie sheet and crumble when you remove them. Bake at 350 degrees Farehenheit for 12 to 14 minuts. While they are baking, mix up the topping. Heat lemon juice just a bit in the microwave. Add sugar and stir it up. When the cookies come out of the oven, remove them to a wire rack with a piece of foil placed under it. Brush the topping onto the hot cookies. The faster you do this, the quicker the topping will dry into a glaze. I’ve been bad about noting making a menu which causes me to figure out what we are going to eat late in the game. I don’t have time for that because I get home from work and then have to automatically start dinner. If I knew what I was going to make, it would make the transition easier. I could get the prep ready beforehand or have hubby start the dinner. The Wee One loves eat whatever you want night and has been asking for one this week which is driving me crazy. We’ve decided that Thursday’s would be a perfect night for that. They eat left-overs or make themselves a sandwich. It is a more relaxed night for dinner. We usually go over to my in-laws for dinners on Sunday nights. They are going to a potluck dinner and concert tonight so we are on our own for dinner. Our dinner is going to be similar to what we have on Sunday nights. The Wee One wanted to make it an eat whatever you want night so I allowed him to help with the menu. He is satisfied with what is planned :). Friday night, the school district I work for’s varsity football team went to a state championship game. They figure the attendance rate was going to be low so they gave us the day off. We have to make it up at the end of the year though. Since I had Friday off, I used it to go grocery shopping without the crowds and boys. There was a lot of manager specials on meat so I nabbed some. My menus for the next few weeks are going to feature some of those meats. By the way, the football team did end up winning the game. They’ve been to state 3 times – 1981, 2010, and 2011. This was the first time they won the state championship. They also were undefeated this year which is impressive! When I was a teenager, I lived with my mom and grandparents. Even though my grandma was a great cook, she never taught me her recipes. Oh, I have a few of her recipes because she gave them to me. However, she and I never cooked in the same kitchen. One of the side dishes, she cook was fried potatoes. I love the taste of the crispy crust of the potato when it’s been fried in a skillet. Yum! Once I got married and moved into a place that I cooked dinner, I started to make fried potatoes. The problem I encountered was that it took for-e-ver for the potatoes to cook up. Through practice, I learned the secret is to put a lid on the skillet while the potatoes were cooking. Not all of the potatoes get that crispy crust though. That’s fine though, the boys refuse to touch them. I get to eat the potatoes with the crispy crust and the boys get to eat the mushier potatoes. One way to check to see if the potatoes are cooked throughout is they become translucent like when they have finished cooking. 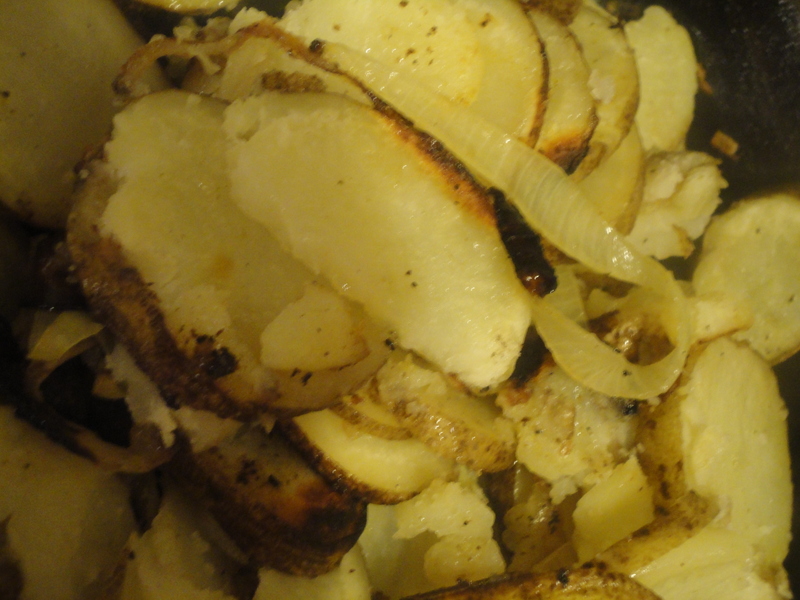 Cut potatoes into slices and onions into rings. Turn the stove on to med. Let the pan warm up. Add the potatoes and onions. Season with salt and pepper. Put the lid on the skillet. Let the potatoes cook for about a few minutes. Then flip the potatoes to make sure they don’t burn. Continue cooking the potatoes, flipping the potatoes every few minutes. 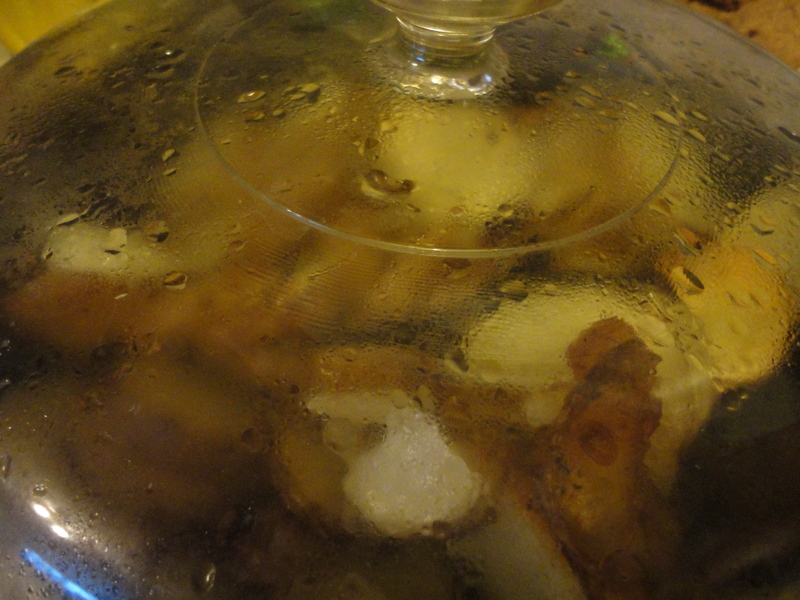 The potatoes will be finished when translucent looking. Today I was given the honor of being a Friday find from Grandma Loy’s Kitchen. Thank you so much for featuring me on your blog! It was a treat to see my picture I had taken in my email this morning.